This blog post is quoted from Jar Al Kamar blog that is originally written in Arabic. He is closely following Egyptian blogger Abdel kareem Nabil Soliman Amer case. I am publishing his last update on Karim's case in English for more outreach. “The pronouncement of a sentence on Egyptian blogger Abdel kareem Nabil Soliman Amer was adjourned to Thursday, January 25, 2007. He was accompanied in today’s court session by lawyers Ahmed Seif Al Islam from Hisham Mubarak Center, Rowda Ahmed from the Arab Network and Mohamed Baymoumy from the Legal Support Association. The session was adjourned upon a request from the lawyers for further case study and pleading preparations. The session was attended by the three lawyers and two persons me (Jar El Kamar) and Mahmoud Al Banhawy. The latter took pictures with his cell phone for Karim. More pictures can be seen here. Karim seemed to be in a terrible situation. The accompanying state security officer to Karim prevented us from talking to him. He was hastily led to custody following the court session. The lawyers got a photocopy from the case file for study. Articles from some sites like Al Hewar Al Motamaden were attached to the file as evidence to Karim’s internet writings. Charges included religion disdain, insulting the president, attempts to flare up sectarian unrest and turmoil and disrupting public security. The case file also included confessions for Karim during the first interrogation process. Confession records contained that he is no longer a Muslim except in the national identity card and that Karim calls for the deletion of any information in the identity cards that indicates religion. A discussion with the interrogator about the ideas he published on the internet and how far he believes in them was included in the case file. The lawyers believe that charging Karim with those three charges might double the sentence which will be determined next Thursday, concluding that he might be spending nine years in prison. The sentence will be appealed of course. The case will be pending in court for a longer time as a result. And Karim’s preventive detention will continue until a decision is taken. 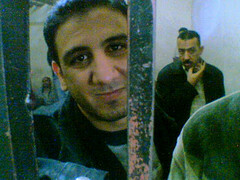 We went to Al-Hadra prison where Karim is detained. We made clear that the solitary detention is based on his personal request. Karim’s brother whom we met at the court was able to pass him some food and clothes and may be money. His family will try to visit him another time this week. Visits were stopped for the last two weeks. The next court session will be on Thursday and it will be the most important for Karim so far. Proper legal and media presence will affect the judge’s sentence. We have noticed today that the judge was affected by the number of the people interested in the Karim’s case. More media and press personal presence will strengthen and support Karim’s stance very much or any freedom of expression cases in Egypt. We will try during this week to mobilize all interested people in this case to attend session. Your presence will have a great impact as you cannot imagine, if you are interested in Karim’s case or any freedom of expression cause. Horrible and frightening. I hope world outrage will allow Karim to see justice. Thank you for making this information available to us. I have sent complaints to the Egyptian embassy in Copenhagen and the Egyptian ministry of foreign affairs. I suggest you do the same: Contact your local Egyptian embassy or consulate. The email address for the ministry is info@mfa.gov.eg. I have written a short piece on my site to spread the word here in the United States. I hope that I can help in some small way to right this wrong. "1) religion disdain," meaning advocating atheism ? Is there really a law against that ? understandable , given the status of Mubarak. "3)attempts to flare up sectarian unrest and turmoil " has he been inciting violence against Copts ? Abdel Karim's blog has a Danish flag on it. What is written on it ? anonymous, (I take it you from DK) has the EG embassy in DK got an URL ? The email address for the ministry of Egypt is info@mfa.gov.eg. If you have a blog, please post this asking people to send complaints to both. Deos anyone ahve an idea what exactly he said? i know he critisized AL Azahr...ok, anyone has the right to critisize, don't see a problem there. But, the question for me is... did he insult Islam??? the religion i mean. If so, then that's a problem. thank you for the update, I have been followig his story. This is very sad, too bad Mubarak is afraid of the truth. God Bless Kareem and keep him safe! 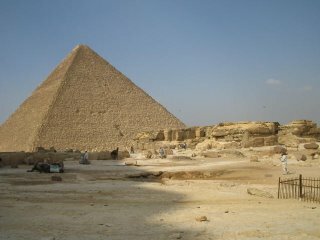 Egypt is one of those emerging middle east democracies bush killer and cundy like to talk about no?